The Motherhouse campus of the Adrian Dominican Sisters is situated on more than 130 acres in Adrian (Lenawee County), Michigan, home to the Congregation since 1884. 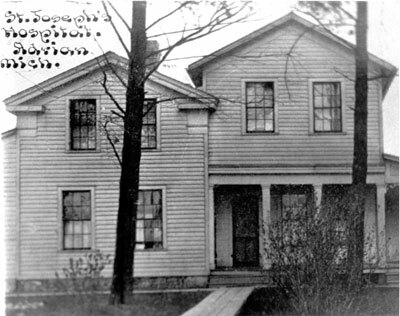 An old farmhouse on the northwest corner of the land became the first residence and ministry, St. Joseph Hospital and Home for the Aged. In 1886, the cornerstone was laid for a larger brick building to be used as the hospital. The foundation of the original building still supports Madden Hall, which has served variously as a school dorm and residence for Sisters and today houses the Congregation’s administrative offices. Campus expansion began in 1896 when St. Joseph Academy opened. Subsequent buildings on the Motherhouse campus included Holy Rosary Chapel (1905) and Ratisbon house, formerly the rectory. The cemetery with its circular pattern of grave stones was dedicated in 1908. 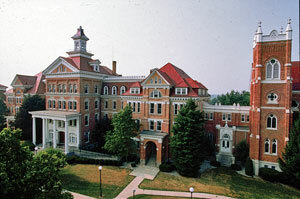 St. Joseph College, now Siena Heights University, opened in 1919 and now stretches west of the Motherhouse on an adjoining campus. The Academy moved into a new building in 1950, which currently houses the Adrian Rea Literacy Center. St. Clement Infirmary (now known as Roncalli) was built in 1926. It was replaced as a nursing home for Sisters with the construction in 1965 of Maria Hall. Maria is now part of a continuum of care complex known as the Dominican Life Center. It includes the Regina residence, which was originally build in 1960 to house Academy students and later became apartments for Sisters. The most recent addition is St. Catherine Chapel, dedicated in 2003. In 1968, Weber Hall replaced the Old North Building as the Congregation’s novitiate. A few years later, it was re-dedicated as the Weber Retreat and Conference Center. The grounds of the Motherhouse campus include the Weber Circle Garden (1996), an outdoor Chartres-style labyrinth (2000), the Cosmic Walk and Nature Path (1999), and wetlands (2001). Permaculture design is now being implemented, with an eye toward long term sustainability of the land that has sustained the Adrian Dominican Sisters. 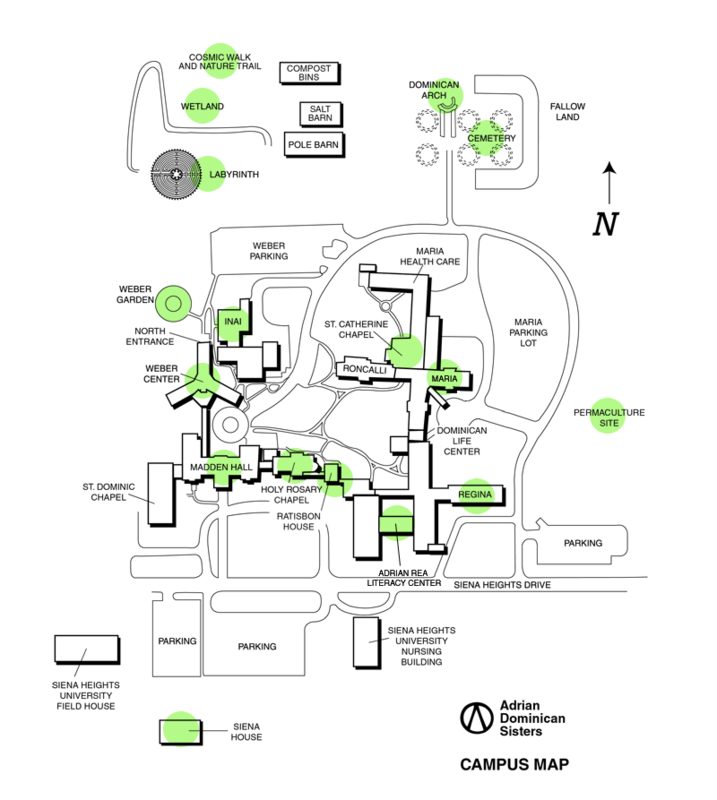 Hover over the green circles on the Campus Map below and catch a glimpse of various buildings and features on the Motherhouse grounds.